I’ve decided to change gears a little with my now fictional story “The Shaling.” As I am writing my story, I started to realize something , , , maybe this is not fictional at all. Then, interestingly, after looking closer to validating the theory of The Shaling, I became my main character . . .exploring, researching and having similar experiences as my character in relation to the story. In short, I am holding off on concluding the book, and I will instead proceed with validating, with scientific and metaphysical methods, that reincarnation is connected to DNA and our skeletal remains. Creator wastes NOTHING! Our bones are here for a reason, and I am aim to prove it! 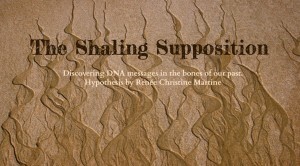 Check The Shaling Supposition page for frequent updates and progress, and or you can always check the BLOG for updates.